he good on Headers?? like crespo at least? they got the same height i think. just 1 cm it's different lol. aren't the players allowed to take any free numbers when they join? if yes then he will take cruz'. Guys while the deal is agreed in principle its not done. So in future please only open threads when inter.it announce it. This is a done deal but you never know with last minute snags. Welcome to Inter, Milito. I am not happy with the deal and giving away young talents but happy with him joining us. We lacked clinical finish up front this season and this is certain where Diego can fit in. I only hope our midfielders do supply him with some chance though. Thread will be closed until inter.it confirms the deal. Edit 30-Jun-2009: Thread re-opened and merged. Last edited by M.Adnan; 30 Jun 09 at 13:18. ...rty with a slightly different significance," said the Inter coach. "We have won the championship and we're going on holiday now, but tomorrow is another day and we have to forget about this victory already and look to the future." We have a milito thread that was closed. The thread should/will only be opened once inter.it releases a press statement confirming the transfers. Just be patient. Hopefully it happens soon, I expect 1 July thought. Its not really official though, that's just Mourinho saying it. Until they're on the squad list the thread won't be opened I think that's the impression I'm getting. 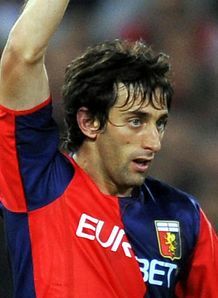 Welcome Milito and was arguably the 2nd best striker in Serie A last year with 24 goals in 31 games. Wish this dude all the best while he's at Inter. Forza DIEGO! Ok let's not exaggrate! Don't put too much pressure on him and don't expect too much from him. Anyway welcome Milito. Hope you can deliver more than that I expect. BTW, could you edit the thread title with Il principe, like in the other thread? I'm sure he will be a suprise to many, like Ibra was. If you don't believe your eyes, believe many italian pundits, who said Inter made a great deal taking this killer machine.